If you’re looking for bathroom suites that save a lot of space in your bathroom then the soft gentle lines of the Affine Amelie range are a perfect match. The modern square look and supreme quality are what make it one of the most popular ranges on the market. The Amelie cloakroom suite is the ideal addition to any size of bathroom; with its beautifully modern styling and clever space-saving design. Within the package you’ll receive the toilet pan and cistern along with the basin and pedestal. Both the toilet and basin use square shapes which are blended together with soft curved edges to produce a contemporary look like no other. Changing your bathroom can be quite the inconvenience at times so getting products that’ll last a long time is key to less stress in your life. Luckily we use the finest materials and manufacturing techniques to produce the Amelie range so a long-lasting product is something we can guarantee. Vitreous china is used with porcelain to create durable surfaces which isn’t just easy to clean but looks fantastic too. Both the toilet and basin are finished in a crisp white which allows neutrality in any setting of bathroom. With Amelie you aren’t just getting a cloakroom suite that looks good but you’re getting a suite that functions brilliantly too. Within the cistern you’ll find the included fittings with a dual flush mechanism. The dual flush mechanism is controlled by a push button fitted to the top of the cistern lid, this allows either a 6 or 3 litre flush of water depending on what waste needs disposing of and is a brilliant addition if your home uses a water meter. For easier installation the cistern benefits from an inlet on both the right and left sides. The toilet seat is the metaphorical cherry atop the cake. It looks gorgeous with its sleek wrap around design and sublime white finish while still being practical with its super-quiet, soft-close system. It’s made from thermoset plastic for comfort and strength, and like the toilet and basin it’s finished in white to continue the modern styling. The Amelie wash basin looks brilliant in any bathroom or cloakroom suite, with designer looks and masses of practicality you really can’t go wrong. It features a single tap hole for mounting a standard mono basin mixer and matches the toilet perfectly with its square yet smooth style. If you need new brassware too then take a look through our range of basin mixer taps and find the one for you. 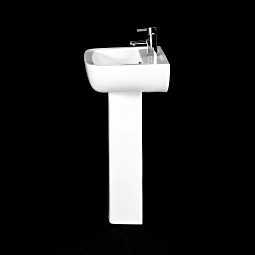 Easily conceal any unsightly pipework behind your basin with a full pedestal, also known as a freestanding or floor standing pedestal. They aren’t just pleasing to the eye either and provide valuable support to the basin, ensuring a strong and sturdy installation. Great WC set, fitted easily and made the installation of a downstairs cloakroom look smart and professional. Looks great, extremely well made and was quick and easy to install. Well recommended.